Yes, you may feel like screeching at all of these corny references, but if you give a hoot about art or wildlife, you might find it wise to attend the upcoming Nature Artists’ Guild program on Thursday, October 1, 2015 from 7 until 9 pm at the Thornhill Education Center of The Morton Arboretum. The guest presenter at the upcoming meeting will be Marla Jedlicka, director of The Wise Old Owls Sanctuary, along with a few of her feathered friends. Marla began her career of rehabilitating owls by volunteering and interning at a small raptor center, which later closed. That is when Marla began the Wise Old Owls Sanctuary, which houses “owls that were once wild, injured, nursed back to health, but sadly cannot be released back to their natural habitat”. Marla also teaches and volunteers at SOAR Illinois – Save Our American Raptors, Inc., dedicated to “the welfare of our native birds-of-prey”. 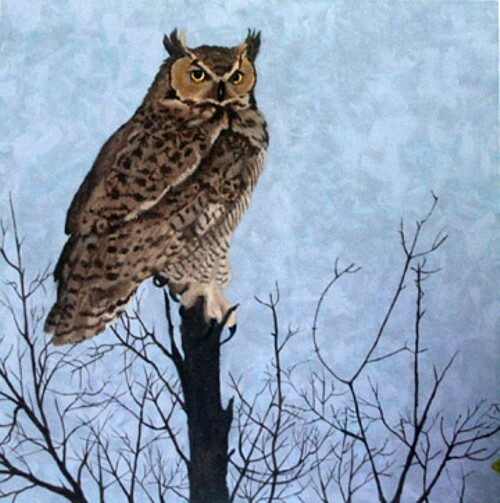 There will be no Great Horned Owls there, (as in Evelyn Grala’s lovely painting, below), but Marla will be bringing some of her rescued Eastern Screech Owls and a Short-eared Owl for program attendees to sketch, photograph, or just learn more about. As always, guests and visitors are welcome to attend the Nature Artists’ Guild presentations. This presentation would be of interest to artists, photographers, birders or anyone who enjoys nature! Parking. attendance and admission to the arboretum are free for this event, and visitors just need to let The Morton Arboretum gate attendant know they are there for the Nature Artists’ Guild program.